Qinghai, China -- Sitting on the floor of his monastic chamber, Kangtang Targyea scrutinized a cotton canvas painting of a white Tara. The painting, which had taken him two months to finish, featured a seven-eyed Goddess on a lotus and moon cushion. Her dark blue hair was adorned with diverse precious ornaments, with a luminous moon halo at her back. Kangtang Targyea lives in a monastery in Wutun Village, a place dubbed as the "hometown of Tibetan artists" in Tongren County, a typical Tibetan area in northwest China's Qinghai Province. Thangka, a kind of scroll painting featuring Buddhist religious themes, is painted with mineral and organic pigments derived from such materials as coral, agate, sapphire, pearl and gold. The more pigments are used, the more expensive the painting, explained Kangtang Targyea. There are rules for Thangka painting handed down from the 7th century, said the 46-year-old monk. The head and body must be perfectly proportioned, and the gold paint goes on after the pencil outline. The right hand of the white Tara must gesture an invitation to liberation, with the thumb and ring finger of her left hand holding a branch of utpala. The tip end of the branch must be pointed at her heart -- no higher, no lower. Tongren is called Rekong in Tibetan, and it is famed for Rekong Buddhist arts like Thangkas, stone carvings and clay sculptures of Buddhist figures. It is also famous for notable artists who grew up there, in particular Shawu Cenam, Targyea's father, a famous Thangka painter in the 1930s. In Shawu Cenam's day, Thangkas were used as religious objects in monasteries, not something for sale. Only monks had the painting skill. Things are different now in Rekong, where "everyone -- monk and layman -- learns the skill and every family owns an atelier, as Thangka paintings are lucrative," said Kangtang Targyea. In the past three decades, Thangkas have gained popularity among individual collectors from Chinese cities and foreign countries, and the price has been driven up, said Zhao Chunsheng, a member of China's Association of Collectors and the author of "Treasures of Thangka". The price of Thangkas in modern times has ranged from 5,000 yuan (about 735 U.S. dollars) to several hundred thousand yuan, depending on the size, pigments, quality and the painter's popularity, Zhao said. Pointing at a canvas depicting the Eighteen Disciples of the Buddha, Targyea said that he would sell the painting for at least 9,000 yuan, and pigments cost only about 3,000 Yuan. "We see more young men learning the art because it can bring more money," he said. About 1,000 people are able to paint Thangkas in Wutun, a village with a population of 1,700. "On one hand, the market helps protect the art, in terms of attracting more people to learn how to paint and increasing the popularity of Thangkas," said Zhao Chunsheng. "On the other hand, it might be harmful to the fine art." Although thousands of Thangkas are produced in Rekong every year, only a few are good, according to Zhao. 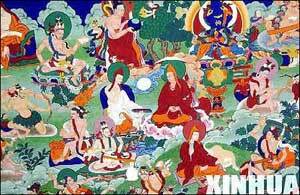 Xihdao, a famed Thangka painter in Rekong, agreed. "Some young painters desire computers and fancy cars. It's irresistible to think of the desires when they are drawing. But back in our day, we only focused on the canvas, which is crucial for painting a good Thangka. "In the past, we listened to Buddhist music when we were drawing, but now, youngsters listen to pop music while painting. How would they create good Thangka paintings while their hearts are elsewhere?" Xihdao asked. "Most people who order Thangkas are businessmen from big cities like Beijing, Shanghai and Guangzhou," said Xihdao. "The businessmen believe the religious-themed paintings may bring them prosperity and blessings. So if they order Thangkas from me, I ask about their family and their wishes before I decide what to paint on." He further explained: "If the buyer's business is not so good, I will paint Yellow Jambhala, the first wealthy deity; if the buyer has a son applying for college, I will paint Manjushri, the bodhisattva of wisdom; if the buyer wishes family members will be healthy, I choose to paint White Tara for him, the goddess bringing health, strength, longevity and beauty." Zhao said some figures in Thangkas are no longer painted with strong Tibetan characteristics -- some goddesses look more like pretty, modern Han women. Some deities depicted in the sutra as ugly and frightening are no longer painted that way. Many tourists like to buy Thangka paintings as souvenirs, since their mineral pigments ensure that the colors would never fade, said Zhao. "As a souvenir, it should be pretty. Who would choose a Thangka with a frightening deity?" For Targyea, the most disturbing phenomenon is that some painters do not mind the rules of Thangka paintings. "A White Tara must be holding a branch of utpala, not a sword," he said. "Maybe some painters do not know the rules," he said of those who had never learned the sutra. Some painters want to break the rules, and they paint real people and railways. Last year, a 195.6-meter-long Thangka entitled "Sky Road", said to be the first to depict the modern life of Tibetans and portray the Qinghai-Tibet railway and beautiful scenery along the line, made its debut at the Qinghai International Thangka Arts and Cultural Heritage Expo. "Sky Road" aroused praise and doubts. Some experts and painters believed it was just a product of commercial activity. "If a Thangka does not feature religious themes, can it be called a Thangka? Without religious content, it is only a painting with special pigments." said Xihdao. But such "Thangkas" are still being made, with subjects ranging from Princess Wencheng of the Tang Dynasty (618-907), to China's reform and opening up in the 1980s. For Zhao, Thangkas should be important teaching tools in spreading Buddhism, because the scroll paintings are easily rolled and transported from monastery to monastery. "But the market has driven Thangkas far from their origins," said Zhao. "A good Thangka should still be a teaching tool, from which one can learn many Buddhist stories. Also, a good Thangka should reveal excellent painting skills," said Zhao. Thangka paintings have sprung up like mushrooms in recent years, and so have problems. "Many young men who learn Thangka painting just want to make lots of money in a short time. So fewer of them would learn from masters. To find a quick fix, they take photos of some masters' works and imitate them. It takes only several months for young people to learn how to paint," said Targyea. He said that there was one Thangka school in Rekong, but most young painters "learn" how to paint by themselves. It usually took Thangka painters seven or eight years to learn from their masters before they could work independently, recalled Targyea. Some agents have opened in Rekong and the provincial capital Xining. These agents buy Thangkas from painters at low prices and re-sell them at high prices. "The same Thangka's price can vary widely if sold by different agents or salesman and in different cities," said Zhao. He said that most inferior Thangkas were sold at bargain prices, since average consumers could not tell the difference. "If this situation goes on, good Thangkas won't be available anymore," Zhao said. "The market needs to be regulated." In 2006, the Rekong Arts Association, which appraises Thangkas and provides certificates, was established in Tongren County. But this is far from enough to regulate the market and protect the traditional art form. "Thangkas of poor quality are vulnerable. Painters and agents should find a balance between making money and keeping the art alive." said Zhao.